NETWORK UPDATE: We had PETER PAN LIVE this morning at 2.3, but other sites seemed to have the number at 2.4. So depending on your starting point, it either gained 0.1 or stayed where it was, but in any case its 2.4 is nothing for NBC to feel good about–nor is its steady drop in viewership from 9PM on. It scored best with Women 50+ and 2-11 year olds (with 11 shares in each group), although it also showed strength with Women 18-34 (10 share), possibly the Allison Wiliams GIRLS audience tuning in. Meanwhile, the CBS line-up tumbled once THURSDAY NIGHT FOOTBALL was pulled out of its numbers: the rerun BIG BANG THEORY fell by 0.2, MOM dropped by 0.5, and 2 1/2 MEN, THE MCCARTHYS and ELEMENTARY all slumped by 0.6. REIGN lost 0.1, and the rerun of HOW TO GET AWAY WITH MURDER gained the same amount. NOTE: most cable shows were preempted last week for Thanksgiving, and THURSDAY NIGHT FOOTBALL aired on NBC, so unless otherwise noted, all comparisons are to 2 weeks ago. NFL Network’s THURSDAY NIGHT FOOTBALL was the night’s easy leader, of course, up 0.52 from the network’s last airing to 3.22. TNT’s NBA doubleheader was at 0.80/0.62, up 0.29 and 0.13. PAWN STARS (History) was at 0.75/0.67, up 0.04-0.05, and PAWNOGRAPHY was at 0.45/0.42, within a hundredth of the last airings. PROJECT RUNWAY ALL STARS (Lifetime) climbed 0.15 to 0.54, and PROJECT RUNWAY THREADS climbed 0.06 to 0.28. Adult Swim did air Thanksgiving episodes, and NEWSREADERS dropped 0.08 from last week to 0.53, while THE ERIC ANDRE SHOW lost 0.06 to 0.44, and THE HEART SHE HOLLER, airing at 12:30AM, was at 0.39. 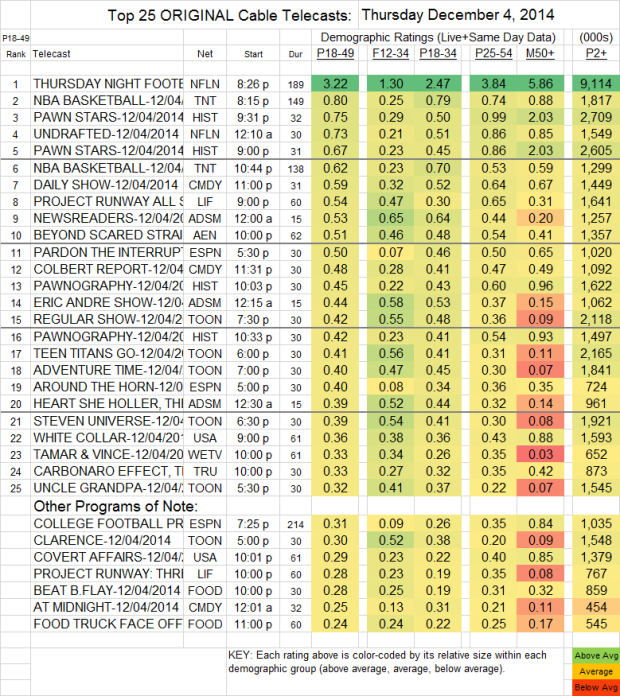 On USA, WHITE COLLAR was at 0.36 and COVERT AFFAIRS was at 0.29, respectively steady and down 0.02. THE CARBONARO EFFECT (Tru) gained 0.03 to 0.33. INSTANT MOM (Nick At Nite) was at 0.17/861K, down 0.09, and SEE DAD RUN was at 0.14/760K, also down 0.09. MONSTERS INSIDE ME (Animal Planet) was at 0.18/307K.